One thing I miss about the days before internet is receiving the occasional post card or letter from a friend. When these letters do come from time to time they are an exceptional treat. I literally can not wait to go inside, so I will often open these right besides the mailbox. By the power of deduction from the title of this site, you can safety assume that I like real mail, by that I mean mail, before pseudo-mail, or email, which in my case includes 2,000 pieces of spam to filter through. Joking aside, I am a romantic and a lover of old-fashioned letters and thank-you notes. The idea came to me of corresponding with my readers like I would with a best friend via snail mail. So I thought the first post on this site should be a letter. Letters have the uncanny ability to bring great joy into our lives. I remember when I first graduated college, I went on several interviews when the days of internet resumes had just began. I graduated in 2003, so it was a mix still of paper resumes and online ones. Most employers, however, did not expect handwritten, paper 'Thank You' notes. The lover of paper stationary that I was then, I could not be stopped by the free thank you notes that came with the box of resume paper. I sent paper 'Thank You' notes to every single person who interviewed me. I have to say that being it was a 2003, there were a great deal of interviews, and most knowingly, rejections. But writing those notes brought me joy, and it kept my focus positive for the next interview. I focused on what I had learned in the meeting, or simply thanked the interviewer for their time. Long story short - I sent one to a recruiter at NY Life Insurance Company on Wall Street. I had not really heard back about the job, until about a week after the recruiter received my handwritten thank you note. So extremely shocked by this gesture, the recruiter actually called me to express how it was appreciated, and offered me the job. It turned out to be too far of a commute for me to go down to Wall Street every day for the sales job, but I will never forget the impact of the simplicity of a handwritten thank you note imparted. Before I met my husband, I read books about letter writing. Many of these books were historical in nature. I loved reading love poems sent in letters by lovers separated by the hands of fate, or letters detailing the nuances of a particular historical era. It was all very romantic in my head. Well, a few years down the line, little did I know the important role letters would play in my own life. When my husband and I first got married in 2004, he was stationed in Fort Knox, Kentucky to do his Officer Basic Training. I, on the other hand, went out to Seattle to get settled at his first duty station and find a job. So the one way we decided to keep in touch was to write letters to each other. I brought something called "Circle Journey" to correspond with him. The kit had this journal we both had to send back and forth, along with pictures or drawings. I bet one day someone will read this and compare mailing something of that nature, to the days of the pony express. But I actually googled it and found it is still around, you can check it out here (even in the internet age you can still find it). Anyways, I found journaling and sending it back to him was a way to connect more deeply than a phone conversation. It really helped me through the time we had apart, and now I still have that journal as a memory. Skip ahead about two years in 2006, and my husband was deployed to Iraq. So although during this time there was some internet access, it was shoddy at times, and letters were our primary means of communication. My husband wrote me a letter every single day that was humanely possible. Some letters were really hard to read. And others, brought me the most immense joy I have ever experienced from a piece of paper. One such letter was the first letter I received from my husband when he arrived in Kuwait for in-processing. Up until that moment, I never fully appreciated the depth of emotion that our connection could impart on my soul. That is the only way I can explain it. And every trip the mailbox thereafter, was a reminder that he was Okay, and he had made it through another day. So as you can see, letters are a big deal, and in my life, they've been one of the most impactful pieces of communication. In that same year, my mother wrote a letter to my husband in Iraq, thanking him for his service and praising him for being a good spouse and father to our first child. My mother dictated me that letter to me from her hospital bed, when she could no longer write herself, to send my husband, the month before she passed away. It is the last thing she wrote, and I will never forget it. I still carry its beautiful words in my heart. Fast forward years later, I wrote an email letter to President Barack Obama about Veterans. I expressed concerns about the VA system and some of the problems that I saw at a time when many veterans were returning from war. A few weeks later, I received a paper letter from the White House, on official stationary signed by President Obama. I still have that letter because of the impact it had on me to see a paper reply in response to an issue that is dear to my heart from the White House. Sometimes a real letter just feels different because you can touch it, hold it, take it in to your heart. A real letter has weight, in both senses of the word. I hope with these stories I can show you the impact that letters can have on people's lives. So my challenge to you today is to write a letter to someone. Anyone. A nice letter, a letter telling them that you love them, appreciate them, or miss something about them. It can be anything, but it has to be sent on paper stationary. :) Why on paper? There is something magic about writing words on a page and sending them sealed and addressed to one person in the world. Letters are different than any other form of communication. A letter says open me now! It reminds us to savor each moment, and live in the moment. It is like a time capsule that seals our emotions on a page, and allows the reader to truly own them. A letter is a gift of words. It fills the other person with your presence. Letters have the capacity to bring so much joy. So as I write this, I hope that you feel appreciated and know I am taking the time to try to pick the right words, although this letter is on a screen. 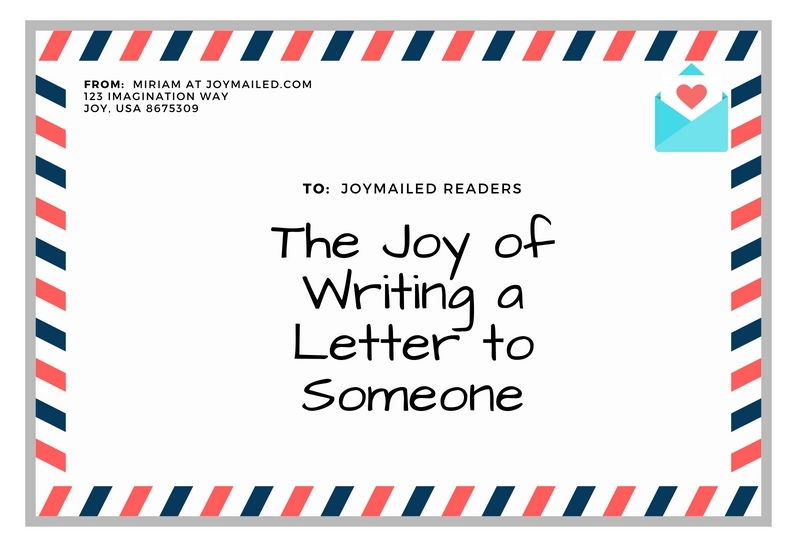 I hope you do something that brings you joy related to letter writing. In today's day and age, letter writing is a thing that tends to get put off for tomorrow, so I suggest only giving yourself a week to write a letter to someone you love. I imagine getting a letter from people like Iylana Vzant, Brené Brown, J.K Rowling, Michelle Obama, Mark Twain, Meghan Markle, Deepak Chopra, Pema Chödrön to name a few that just came into my mind right now. I think, what would a letter from them sound like? Then I am reminded that every person has a unique presence that can be felt-and the only other time I have felt this presence is through letters-not as much on email or phone. In a letter, you can get lost, and truly feel that person's energy. So share that magic with someone you love today. Or even write a letter to yourself a year from now, and yes, have someone mail it.